back to front binding D.W. This binding was done as a back to front binding. I have given instruction on this binding before but not this wide. The reason I am repeating and showing these instructions…I didn’t want to loose any of the width of the outside squares. That would have looked a bit “off”. So, my solution was to extend the batting beyond the pieced top edge. This gave the extra width I wanted for the binding and did not take away from the pieced front squares. I quilted into the batting and backing layer beyond the quilt top so it would have a similar feel and weight of the rest of the quilt. I used a number of basting lines to be sure I had enough batting and backing to make the Back to Front WIDE Binding. I will post the steps below! Backing – Allow double the width of desired WIDE binding plus extra 1/4″ – 1/2″. 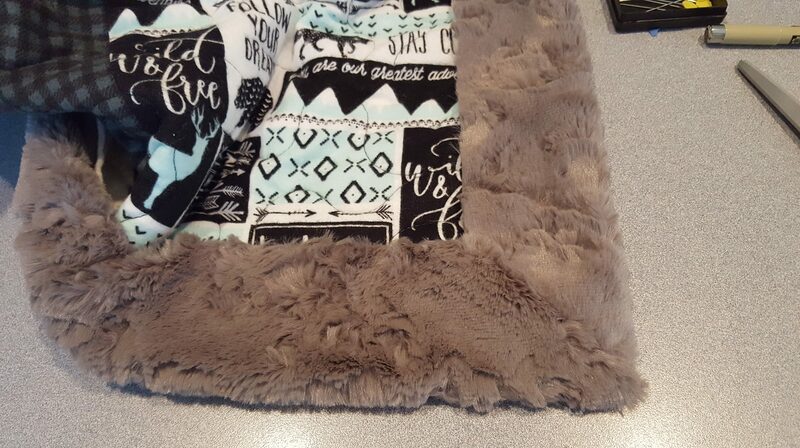 For quilting, I loaded the Cuddle backing on my longarm but you can accomplish the same on a domestic machine. Layer – Layer batting then quilt top, same as layering for any quilt. Where this technique will differ… make sure to allow for the extra batting width and backing on ALL four sides. Quilting – I basted down the raw edge of the quilt top. I also basted a line 2″ beyond the top’s edge. 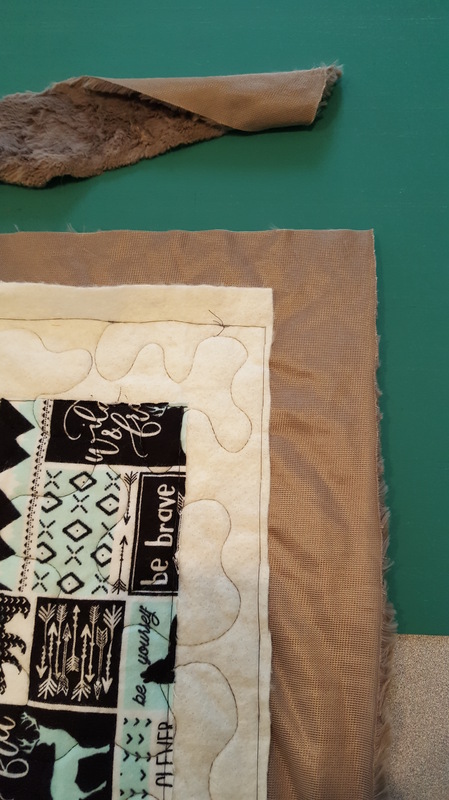 When quilting, I extended my quilting design over the top edge into the exposed batting. This gives the back the same look all the way out to what will be the new outside edge of the back. 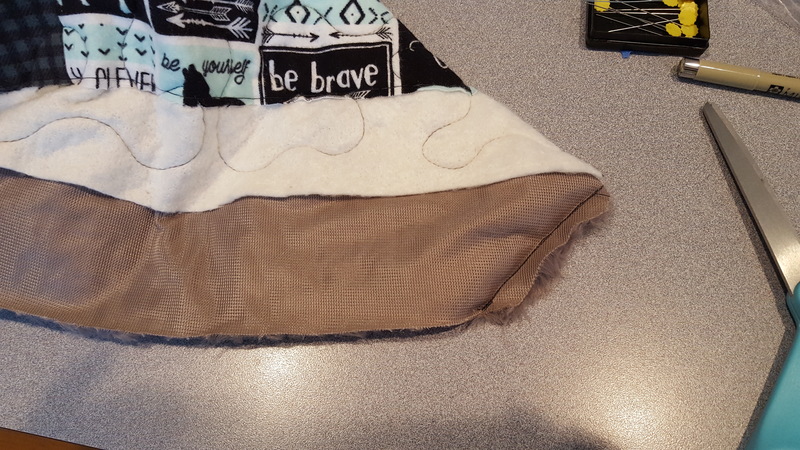 Trim – Trim batting just outside of the basting line you stitched 2″ beyond the top. Scissor cut the batting! You will need the backing fabric to extend even wider! Trim backing 2 1/4″ – 2 1/2″ beyond the trimmed batting edge. See photos for back to front binding finishing steps or refer to my previous posts on the technique. All batting trimmed, basting removed and folded for B to F binding corner seam. TaDa!!! A wide back to front binding without loosing any of the width of the outside edge of the quilt top! This technique can be done with “regular” cottons as well. I would recommend your turn a hem in the backing edge so you do not have a raw edge. It is o.k. to have a raw edge with Cuddle, it won’t fray. 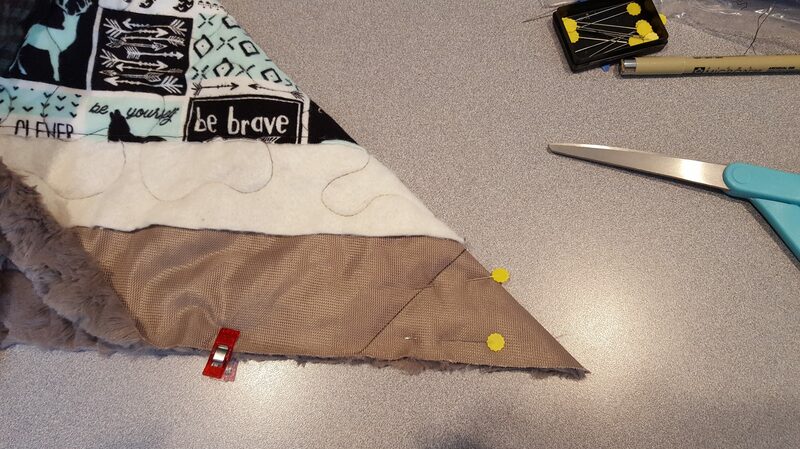 #1 – A WIDE Back to Front Binding can be added without having to add extra width to the quilt top. 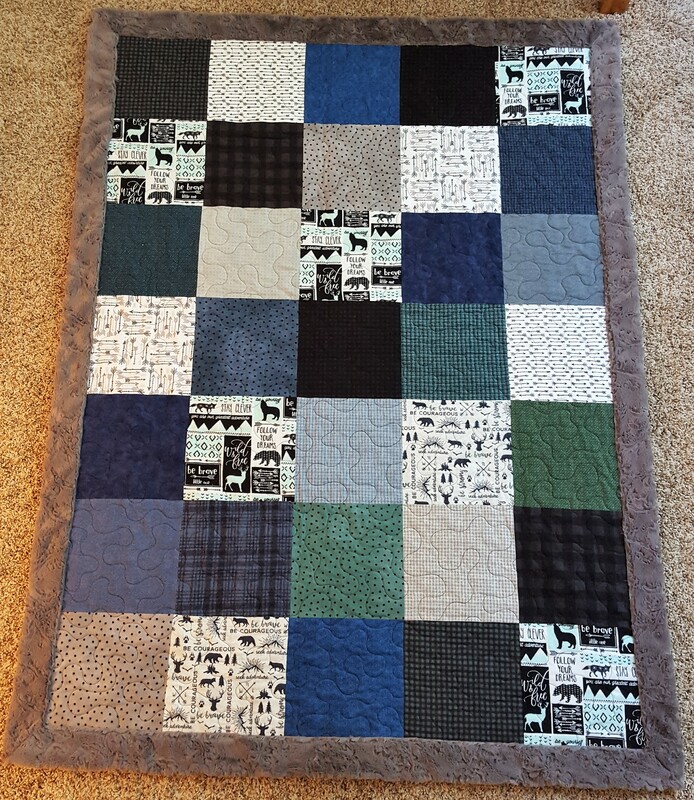 #2 – By following the tips in the above instructions and photos, it is an easy edge for a Cuddle Baby quilt!! This entry was posted in Back to Front Binding, Cuddle, Uncategorized. Bookmark the permalink.